I think many of my friends out there who spent time with me in group studies will never forget this Big book which we had in our engineering syllabus. When I read this book in my sophomore days it imparted a very little knowledge to me. We always gave importance to C, C++ and finally the Lingua Franca JAVA. Our talent was judged based on how well one can code in any one of the above with importance in the given order. Here in these we write the code, see the results pat ourselves on our success. So this was the best part of our engineering syllabus. Then came the concepts that had a second round of importance Theoretical Computer Series - Advanced Data Structures, Algorithm Analysis, Theory of computation and Discrete Mathematics. If one explains these concepts well he would be called as a technical Buff. They were considered amongst us as the one who will be giving the next generation of new algorithms and new Languages. Next , “It’s already done. We need to know the concepts alone – series” - Database Management Concepts, System Software and Operating Systems. These were only improve our knowledge on the computer field, but since we did not try any thing to implement in this more than a Cross compiler which I did as my placement project. Finally, Artificial Intelligence and Natural Language Processing series – The ultimate abstract concepts where we enjoyed sometimes by laughing at Turing tests and cried sometimes at evaluations in NLP. But now, in the four grouping I gave, I am working with the third one. I am not working with C, C++ or Java. Rather I am not writing any algorithms. My last algorithm which I wrote was for my Fractal Image Compression using Fractal dimension. This has been selected in one of the International journals, will soon give the info once it is published. I am not in Powerset to give some AI or NLP solutions. Now I work with database, database and database only. I try to write good number of Sqls and PL/SQL statement every day. 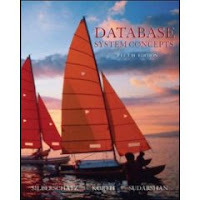 But after working with database almost a year made me read this Database concepts book. Lots of insights I had. So many concepts now are so clear to me. Right from Relational Algebra & Query Evaluation to Transaction & Concurrency control every thing strikes clear to me. The Edgar Codds 12 rules had been my favorite and still remain the same.